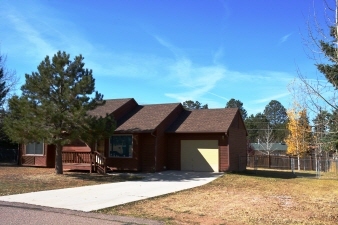 PRISTINE RANCHER in City of Woodland Park. Walk to everything. Close to schools. Enjoy coffee on the east facing front porch. Lots of closets. Renewal by Andersen vinyl windows, new carpet, lovely wide-plank laminated floor in dining room and kitchen. All appliances included (washer/dryer, dishwasher, electric glass top stove, newer top-of-the-line refrigerator. Pets will love the large fenced back yard. Low maintenance structure would make a great vacation home or VRBO! Exterior Features Large, level yard with fully fenced backyard. View of Pikes Peak from backyard. Covered front porch, concrete driveway, finished 1 car attached garage. Deck off dining for evening BBQs. Additional Features and Amenities Added insulation in attic. New vinyl windows. New carpet. New roof. Newer furnace.